Home MagazineMinistry of Cool	RAW FROM THE SAW: Hail, Caesar! RAW FROM THE SAW: Hail, Caesar! Out of any director working today, Ethan and Joel Coen stand on a podium strictly for their knowledge of the medium and their latest film, Hail, Ceasar!, is a prime example of this. This could be attributed to the fact that there’s two people directing, but, even so, is a vast knowledge of the medium enough criteria to praise their new feature? The duo are synonymous for making some of the best films of the past two decades such as No Country for Old Men, The Big Lebowski and Fargo, to name a few. Like most directors, the Coen Brothers haven’t had a perfect track record and some of their films missed the mark completely; , we’re looking at you, The Ladykillers. Three years since their last release, Hail, Caesar! falls somewhere in the middle. The films stars Josh Brolin, in his third collaboration with the directors, along with a star studded cast of George Clooney, Ralph Fiennes, Scarlett Johansson, Jonah Hill and Channing Tatum. The film takes place in 50s Hollywood and is, in essence, a love letter to not only cinema at the time but to the filmmaking process as well. While the trailers would tell you that the story is about George Clooney’s character, Baird Whitlock, being kidnapped by a secret organization, the film revolves around Brolin’s character, Eddie Mannix, the Hollywood fixer responsible for keeping the studio in line and the stars under control. His conflict draws from a recent job offer and he must decide whether to leave the industry or not. The entire cast gives great performances; playing larger than life characters in 50’s Hollywood seems like fun to the actors and this oozes from the screen. The film is fun and light, but the tonal shifts throughout are distracting and draw away from the serious moments in the film. We never get a chance to care about Mannix’s internal struggle for taking the other job because the film doesn’t focus on this. Instead, we get hilarious performances and scenes from a Hollywood that’s been long gone and forgotten. Tatum, doing a spectacular long take dancing number, and Johansson, struggling with her decision of which celebrity to marry, are fun and entertaining, but give no emotional substance to the film. The Coen brother’s try to pump the script with religious themes and question of ethics of the way films are made, but it still comes across as unbelievable and just stitched together. As always, cinematographer Roger Deakins produces a visually stunning film, using sequences in the film to mimic the way films were created 60 years ago. Using wide shots with backdrops just like the movies being shot within the film itself, everything is reminiscent of the period. The writing is tight and consistent, but the film lacks a sense of purpose and direction, which is surprising from such acclaimed filmmakers. 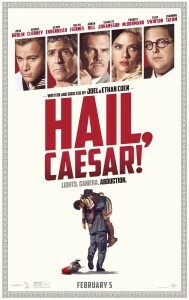 In a way Hail, Caesar! felt like a film that the Coen Brothers knew they had to make but they didn’t know how to piece together. So instead they tied a bunch of lovely scenes together, remembering the way films used to be and forcing religion into the mix. Without an emotional core from any of the characters, these scenes become meaningless, leaving Hail, Caesar! as a missed opportunity.